Jason currently works as a Koorie Engagement Support Officer with the Department Of Education. Jason’s passion for the job is in supporting the development of Individual Education Plans that identify and meet individual students academic points of need in numeracy and literacy. Also developing strategies for social connections and setting short term GOALS that enable young people to experience measurable academic success that leads sequentially to long term success. Jason is the Mutthi Mutthi Wuthunghi (man) responsible for ceremony and calling on the ancestors in ceremonies such as funerals or healing and cleansing ceremonies such as traditional smoking ceremonies. 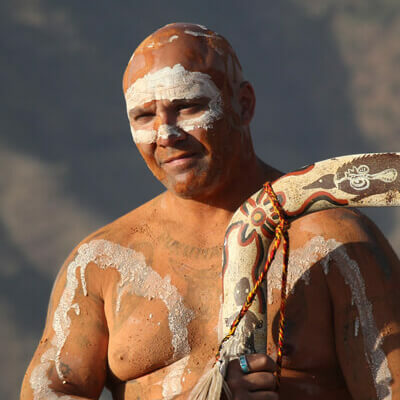 He led the smoking and welcoming ceremony in Balranald for the Return to County of Mungo Man, and his passion is healing through our connection to mother earth, our ancestors, and the universe.